Dance the night away's pop'n music banner. Dance the Night Away's jacket. Feel the swing and let yourself go. Dance the music all night long. Feel the rhythm let your body groove now!! just feel the music's energy. You got to feel that beat. So come on baby dance with me now. In beatmania THE FINAL / beatmania III THE FINAL, Dance the night away's title is capitalized as DANCE THE NIGHT AWAY. 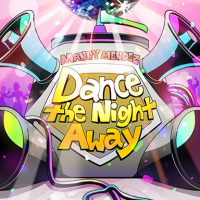 In the GuitarFreaks & DrumMania series, Dance the night away's title is capitalized as Dance the Night Away and the artist was changed to MANNY MENDEZ. Dance the Night Away was added to GUITARFREAKS 10thMIX & drummania 9thMIX on December 17th, 2003 via ee'MALL 2nd avenue. AFRO appears in Dance the Night Away's banner and old jacket. Dance the Night Away has never been on a CS release of GuitarFreaks & DrumMania. In the GuitarFreaks & DrumMania series, Dance the Night Away is not available for session play. Unlike バリバリブギ～涙のフルーツポンチ～, Dance the Night Away is still not available for session play upon its revival in the GITADORA series. Dance the night away is one of the few ee'MALL songs that were only available for GuitarFreaks & DrumMania at first. It was made available to be played in pop'n music in pop'n music 14 FEVER!, months later after the ee'MALL service ended, as one of the songs part of Episode 1 of the Fever senshi pop'n 14 (フィーバー戦士 ポップン14) event. It could be unlocked from July 5th to July 12th, 2006. Dance the night away appears as DLC for the American version of pop'n music (Wii), in the Disco set, where the Dance the night away's artist is capitalized as Kaz Senoo feat. Manny Mendez. Dance the night away was moved from the pop'n music 14 FEVER! folder to the ee'MALL folder in pop'n music 16 PARTY♪. Due to the BEMANI category restructuring in pop'n music Sunny Park, Dance the night away can now be found in the GITADORA folder. Dance the Night Away is the Part 1 unlock of GITADORA Matixx's Natsu wo sakidori!! Fukkatsukyoku Fes!! (夏を先取り!! 復活曲Fes!!) event. It could be unlocked from June 11th to July 5th, 2018. It received a new jacket in GITADORA Matixx. A dance track filled with a little nostalgic disco classic atmosphere!